This is an alternative to the toxic smelling PVC cement and primer! Non flammable and virtually odorless and user-safe. This is primer and glue in one; the "greenest" PVC glue on the market. 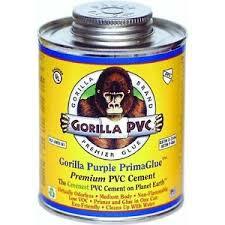 Gorilla glue can be used from 32 to 140 degrees. After gluing joints, wipe down with a rag. This glue is purple and oozes at the fittings from the joints.